Hi folks, we picked up our 2014 Raptor 27FS yesterday and I'm not real good at leaving well enough alone so, I thought I should sign up here and have a look at some of the things people are doing with their trailers. My wife and I have been camping for about 3 years with our previous toy hauler and figured it was time to get more comfortable. We carry a golf cart with us for various recreational golf cart events. Looking forward to steeling some good ideas as well as hopefully providing some good ideas. Welcome Essness is that a Burlington Rv lot your trailer is in ? 4 slides. Weber Baby Q100 grill, Red solo cups. 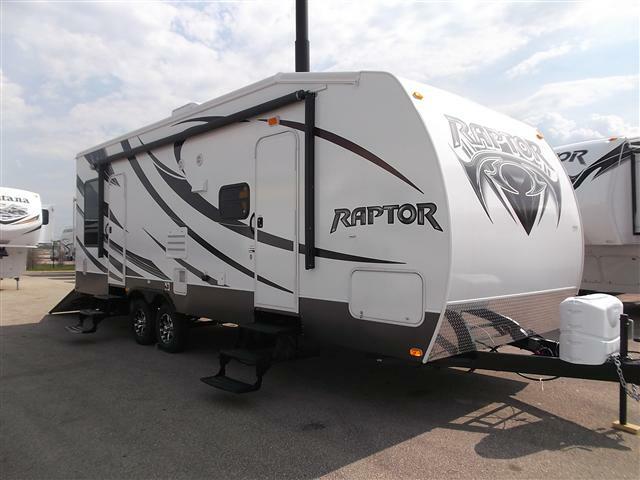 to the forum from the East coast,glad to have you aboard and good luck on your new Raptor Happy camping. We're actually in Powers Lake. Where are you? Looks great, congrats and welcome.